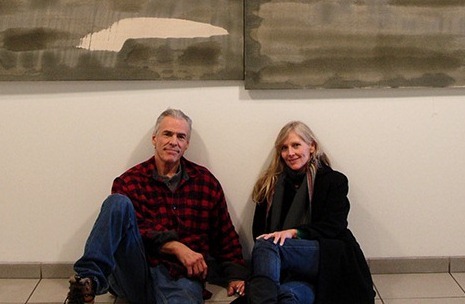 Janet Trierweiler and Matthew Schaefer are Evanston painters and the latest artists to be featured in our ongoing exhibition series Local Art @ EPL. Their show – titled We do not need to leave the Earth – is currently on display on the 2nd floor of EPL’s Main Library where you can catch it through the end of February. Working collaboratively as Calaj, their deluted oil paintings on linked canvases strive to create a viewing experience “of refreshing vulnerability and psychic relaxation.” You can learn more about Ms. Trierweiler’s and Mr. Schaefer’s Calaj paintings by visiting their website, and you can meet the artists themselves at a closing reception on Wednesday, February 26th at 7 pm. We recently spoke with Ms. Trierweiler and Mr. Schaefer via email about their artistic origins, creative rituals, and philosophical interests. Evanston Public Library: Can you tell us a little about your artistic backgrounds? How did you both get started in art? Was there something specific in your lives that sparked a need to create? Matthew Schaefer: My family was always interested in art and artistic discussions. We often visited art museums in New York and Chicago, which has given the pursuit of art a validity as a career. I was directed to consider myself an artist at a very young age. I attended Silvermine College of Art in New Canaan Connecticut, a school of 300 students in a rural setting, 60 minutes outside Manhattan from 1968 – 1970. This attendance gave me the commitment I needed to continue painting as a lifelong endeavor. Janet Trierweiler: I was an observant child. I remember finding great beauty in the wood grain patterns on the doors in our house. That sort of observation gave me peace and kept my attention at length, more than usual sorts of entertainment. Some of the most poignant memories I have are of people doing creative things. My father was an artist and loved music. I don’t think I had a choice. I feel that art was the chosen path for me. I attended both the American Academy of Art, where I was trained in a classical style, and the Art Institute which may have ingrained more conceptual ideas into my art. My greatest artistic challenges, development and joy have been in the last five years through my relationship and collaboration with Matt. EPL: How did you begin working together? JT: I happened upon Matt’s work at the former D-Gallery while walking in Evanston. I was knocked out by the similarity in our work. His figurative paintings had the authentic, energetic and objective quality of the Bay Area painters that I loved. As fate had it, my gallery was having an invitational exhibition, and I was to choose an artist to show with. I had chosen a striking red painting for the exhibit, and when Matt came in with a red painting as well, it further revealed our kindred spirit which led to our working together. EPL: How do you describe your collaborative paintings? JT & MS: That which represents our relationship rather than us as individuals. EPL: Do you see yourself as fitting in with any particular artistic movements or styles? JT & MS: No, we don’t feel affiliated with any particular movement, but our paintings have been continually inspired by the work of Joseph Beuys and his disciples. By objective observation of our paintings, we have become open to movements that in the past we have felt separation from, such as conceptual and minimal painting. Our collaborative paintings develop not from other styles or other movements, they are a result of us working together. We are individualistic but found a place to nurture the third element, the relationship. JT & MS: We do sculpture and performance that are in line with our painting philosophy. We see an infinite capacity with the tradition of oil on canvas which is prepared to allow impetuous expression. We both love materials and techniques, experimentation is in our blood. There is a creative opportunity working with these traditional materials in an untraditional way. We want the true record of our spiritual condition. Through this method a quality of authenticity is recorded. EPL: Can you give us a window into your creative process and elaborate on the painting techniques you developed? JT & MS: We develop an expanded state of mind by continually refining the ritual steps or preparation that lead to the application of the paint. We bring our full awareness to the familiar or second nature of these technical skills, bringing meditation or psychic release, which in turn evolves the painting. This meditation attends to our attitude, refining the work, rather than having to go back and fix the painting. If the attitude is “well we can go back and fix it” we don’t really have to try. We refine our attitude going into the work, knowing that, like calligraphy its true value is in its direct response. Our process is our technique. We’ve developed many ritualistic steps to create the paintings. One of the most difficult and important steps happens after the painting is finished. We call this step “the walkaway”. Because of the exposed vulnerability of the authenticity, the tendency is to judge and manipulate. Instead, we turn our backs and walk away, believing in the direct response more than our own egotistical needs. EPL: Where and when do you work? JT & MS: Because of the character of our technique, the dependency on our personal psychic well-being, every aspect of our life adds or detracts from the quality of the final work. There is a direct relationship between the quality of the skill and the quality of our individual characters and development of our relationship. This particular process requires that we are always at work. JT & MS: To take the time for a momentary pause, changing reaction to response. To illuminate this “other place” readily, we create work of striking attraction, making easy the journey from the mind to consciousness, a world of unintellectualized objectivity. EPL: What does the name of the show mean, and how does the titles relate to the paintings? JT & MS: “We do not need to leave the Earth” refers to a recognition of Universal order that is present in our everyday lives. To allow beauty and harmony to lead us to a refreshing vulnerability and momentary relaxation of our mental activity. In other words, to create a diversion from intellectual chatter. We do not need to leave the Earth to seek pleasure by material means, we can find happiness within ourselves, observing the harmony of nature’s order. We leave desire, not by physical means but by our state of mind. The titles refer to our kindred philosophical interest. They connect to the physical world, something intellectual that keeps us grounded to the earth and honors history. The titles we create are symbols we can share, helping us to define our feelings with the intellect not just the sensations they evoke. It gives us a way to communicate and share the idea. EPL: What are your future artistic goals both individually and collaboratively? JT & MS: We have enjoyed an organic evolution. We wish to continue to evolve in our personal and artistic endeavors. Our future is to extend our work further into the world to share what we feel is our message, what we have to give to the whole, our society. EPL: Are you currently working on any other projects? JT & MS: When opportunity arises, we develop sculptural projects that are site specific and performance related. One such project, “Going to Work,” entailed working simultaneously yet independently on the same sculpture. Working in an exposed public venue we shared the project through silent meditation, not discussion. We also look for opportunities to display our large scale paintings, site specific or otherwise. JT & MS: We support and participate in the development of a lively artist community near Florence and Greenleaf. We have enjoyed both teaching and exhibiting opportunities at the Evanston Art Center and the Noyes Cultural Arts Center. We are both represented by Homey Gallery in the Fulton Market area of Chicago and Gallery Uno, Chicago/Berlin. EPL: What inspires you as an artist about the community where you live? JT & MS: The lake, the cross section of individual characters, lively architecture and the woodland quality of Evanston inspires a daily practice of observational drawing. Posted on February 14, 2014 February 13, 2014 by EPLPosted in Local Art @ EPLTagged evanston art, interview, Janet Trierweiler, local art @ epl, local artists, Matthew Schaefer, paintings, Russell J..